I know that I take a lot of photos of Lino, but I find him endlessly inspiring. 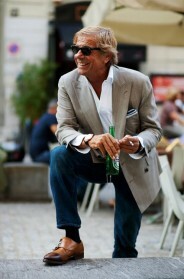 I love how he eases into Spring with a soft pastel tie and pale grey DB sportscoat. Perfection for this time of year. Love the color palette and accessories … he's got an eye! I CAN'T BLAME U FOR POSTING PICZ OF LINO! HE HAZ A PRESENCE THAT COMMANDZ RESPECT. BUT AT THE SAME TIME HE HAZ FUN WITH STYLE. HE DOEZN'T SEEM STUFFY OR UPTIGHT. AND IT MAY BE OPEN FOR A HUGE DEBATE, BUT I FEEL HE'Z A GENT THAT HELPED BRING DOUBLE BREASTED SUITZ BACK TO THE FORFRONT. IN MY OPINION. grey is very under-rated. it is the most harmonzing, comforting colour. this jacket and tie combination are divine. if only men dressed like this in sydney. he looks so great with the pastel tie on the light blue shirt. mr spring! In his otherwise very masculine appearance, he has on the most dainty chain that caught my eye before anything else. 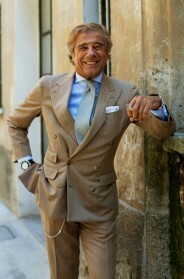 Ive always been in two minds about the way Italian men dress. Being half Italian and yet growing up in Australia, at times, I find it a little too effeminate or even contrived. But, the thing is that you really have to see it in the context of Italy, and that's where it toally makes sense. love the colors in his outfit. amazing. He certainly knows about style. Great colors, but especially love the cat chain! Man, he has an awesome watch collection. That is the second Patek Philippe Nautilus (reference 5711) I have seen him sporting. The other one was the chronograph (reference 5980). Ooh, that watch chain(?) is a delicious touch. I must say I'm not crazy about the chain — it doesn't work for me, especially how well dressed he is. While not a wearer of double-breasted suits myself, it certainly works on him, as do the color choices. But most importantly is his energy that this photo captures — yes, he's dressed well, but it's clear he lives well. nice blazer! the cut is outstanding! Great palette, great fit, but I think he would look even better if he tightened the full Windsor knot in his tie a bit. not wild about that tie (is it colour? the texture?) but he's totally rocking that wallet chain, esp. with the DB. LOVE LOVE LOVE LOVE LOVE Lino! Nice Patek Philippe Nautilus, not sure about the wallet chain? but I don't know why I really love this guy. Everything about him I just wanna go and be his friend! From his chain to his tan, he is so suave. Sorry, but not feeling the tie or the questionable knot and the overall outfit doesn't look right. That said, I do think Lino has displayed a number of good items over his various photos, though not much good looks overall. All my opinion, of course. i love his expressions.. hw zealous does he look towards life…. with so much of experience to share…!!! So obviously Italian style allows men to retain a sense of masculinity in clothes that would likely come across as effeminate in almost any other context. Of course Lino is nothing if not Italian, and his look embodies a sense of personal rigor and a breezy authority that does not come across as stuffy or referential. No doubt he knows how to dress. But that is an unbelievably phallic tie. Umm, well, doesn't his outfit look New Jersey? And I don't mean that in a good way. Love this! The colours are genious with the jacket and with the hue of his skin: grey transitions to light blue which plays well with the orange sherbert tie, all complementing is complexion as well as his spring like attitude. the watch is fantatic. and the chain is an interesting detail…i thought at first a pocketwatch but since he has one on his wrist, i'm thinking there's a key ring on the end of the chain. he looks like a PAPPA. that's all. The shade of that tie is incredibly lovely and very unconventional on a man! I love how it completely picks up on his warm tan too. He looks so classy, the colours go so well together. Indeed very "springy". I also just wanted to know that I am trying out for an education I really want to do. It's on an artschool and has a lot to do with fashion and styling. I had to do some assignments and I was actually kind of freaking out (it's a very popular course and they only have a few spots to fill). So I went to get some inspiration yesterday and came across your book. I bought it immediately and I'm so happy I did! Thank you so much for making such great pictures of great people! And it was also very interesting to read your comments about them. I have tons of inspiration buzzing trough my head right now, thanks again! I can't wait to see your pictures from Japan! Ti amo Mr.Spring of Milano! Lino and Simone,two faces of the same coin. Simone is the tasteful side. Lino is the grand guignol. Really, what is the chain for? switchbalde? anchoring the family jewels? as an Italina man, can I comment that there much better specimens? He looks so confident he could carry anything off. Not sure about the cigarette as accessory though! Lino is the man! He should have a daily post somewhere himself. I wonder what his wardrobe must be like (how extensive, the range of colors). Greaty style!! Lino is one of the most stylish men I have ever seen. his store is just in front of my house and my father has always bought many things there, when I grew up and I needed my first suit, I knew I wanted to get it here, since then I've bought so many things there because I know i can find something perfect for me, and I'm happy that other people appreciate Lino! sorry for my english, I know it's not perfect. I like the DB and shirt, but the tie looks like it's going to eat him, and the chain is terrible. I usually agree with your taste Scott, but this time I really can't. The colour palette is cool ok, and also the fabric texture of the jacket. BUT the over-tanned skin and dyed blond-yellow hair (at that age…), the super big tie knot, the horrible metal chain at the trousers, the bracelet, and the overall Berlusconi-like look just communicate bad taste to me. Elegance in my opinion should be something much more sleek and refined, never screamed out. This guy is fabulous. I especially like the peach tie and the thin chain. An exciting look for sure. This men is very elegant… In Milano… All is elegant. I tire of seeing some of the same people on this site; Lino is not one of those people. He got me thinking twice about DB suits and sportscoats. Fine & dandy except the chain which should be restricted to 12 yr old skaters. He's got a nose for beautifully cut jackets. Bloke's amazing. 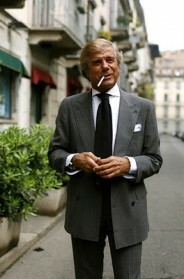 His pictures are always a great insight into the style of Italian men. It looks like he is wearing three watches (two at wristesand a pocket one). That flesh-colored necktie looks like he's being choked by an arm coming out of his coat. Al Bazar needs a blog! I need to see what Lino is wearing everyday. I am going to Milan in one week and Al Bazar is my first stop. I will be buying the money clip chain to spite all the haters. I love the length of his hair and how he dares fashion. I mean, a double breasted sportscoat and then the colours! He is just wonderful… eveytime I see a picture of him I try to go for his look wihout making a carbon copy of it, he is totally cool, masculine, charming, interesting… This reminds me I do need a nice grey db jacket. That's a $20,000 watch. What does do for a living? well he looks very (VERY) Italian to me. so Italian. I know he is, but it's been a long time now since I've been to Italy. I love the color combination of the blue, salmon, gray and black… not so much the cut of the jacket or the very thick tie… but it's all in the way one carries him/herself that makes a style. Scott, I would love to know… repeatedly shooting some of the same people, do you ever see them repeating the same piece of clothing? I would love to see what their closets look like. How big are they? Or do they change their entire wardrobes every year? You cannot post too often about Lino. Even for those of us — especially for those of us — who haven't his means or style sense, or whose style isn't Lino's, he remains singular, a treasure. Keep it coming! (P.S. — I agree w/ a previous poster who remarked on the size of the knot: you could clip it and play World Cup soccer w/ it!). I bet Lino was quite the stud muffin in his day. ;) Love the chain and the peach tie! oh my… I love your blog and didn't want to post anything negative, but it's the first time i really disagree with you: He seems like a fun guy, but it looks like his tie is going to strangle him, the jacket doesn't fit him (too tight), and the chain… yikes! I hope my husband is this ridiculously good looking at this age. I'm in love with this man and his style. I hate pink ties. In Italy are around from 20 years now, normally associated with non style people. Lino rocks, he's an inspiration to me. He is sort of "way out there" but with soft strokes instead of in your face like a Jackson Pollack. I love the watch chain peaking out from under his blazer. He is truly suave, and this is a lost art for most people, unless they are a bit older. We should all take a lesson from Lino. He sure softens the formal double-breasted coat with the light springtime colors. Is that a tie or a bib? This time I find he' trying too hard,it doesn't look like something he just put together. Especially the tie, could be the light, but fabric looks too heavy for spring color and knot is out of proportion. Wish he would let his natural hair color grow out. I think we should all try to be a little more Italian! Lino always looks good. I love how he uses understated accessories to personalize his look. His color combinations are unexpected and he always seems to make them work. Well done. He looks so un-Milanese or maybe new-Milanese. PERFECT… SMOOTHIE AND ELEGANT!! DON´T WORRY ABOUT THE NUMBER OF PICTURES OF LINO. HE INSPIRE THOUSANDS OF GUYS AROUND THE WORLD LIKE ME, WITHOUT MONEY TO DRESS UP LIKE HIM, BUT WHICH A GOOD TASTE AND WORK HARD TO DRESS WELL TOO. LINO FOREVER!! I bought that jacket at Al Bazar last week and IT…IS…FREAKIN'…AWESOME!!! We need to start a Lino fan club!! hehehe He is too much!! hahah I love him! …un confetto !! da che pasticceria arriva ? … per il resto tutto bene ? 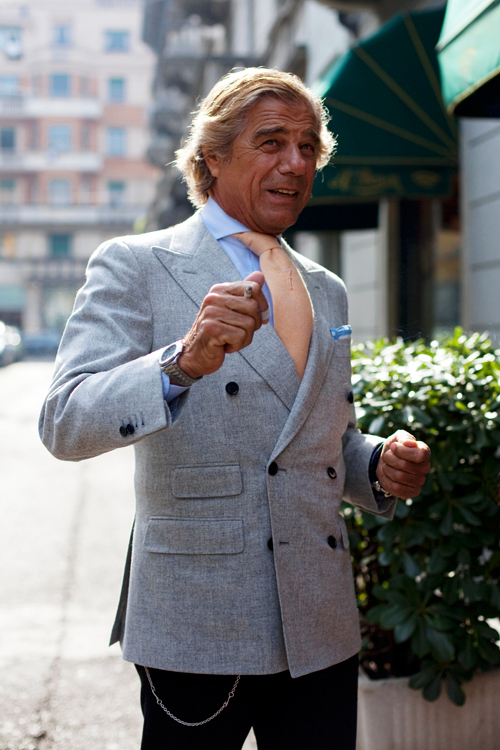 On the Street……Lino of Milano!